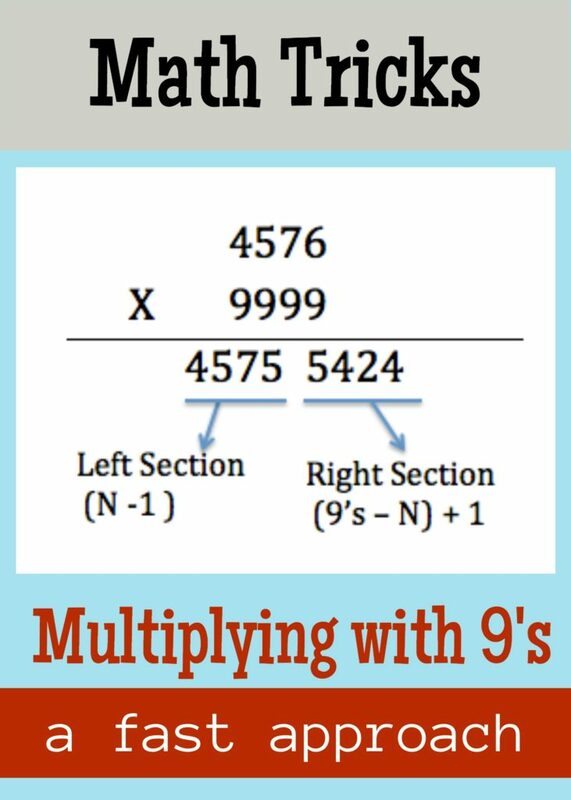 Today I would show you a quick and fail-proof method of multiplying with 9’s. The number 9 is a magical number, any mathematical calculations done with this number would produce some interesting numerical patterns. To multiply a number N with 9’s, divide the result into two sections – the left section and the right section. 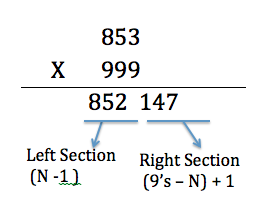 The left section would be ( N-1 ) and the right section would be ( 9’s – N ) +1 . For example, 4576 × 9999 = 45,755,424. The left section of the result would be the number 4576 – 1 = 4575 and the right section would be 9999 – 4576 = 5423 and adding 1 to it which would be 5423 +1 = 5424. Let’s try with some other number, may be 853. So, if multiplying 853 x 999 = 852,147. 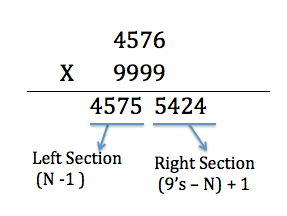 The left section of the result would be 853 – 1 = 852 and the right section would be 999- 853 +1 = 147. So, leave your calculators aside and have fun multiplying large numbers with 9’s in a fraction of a second and don’t forget to like my page if you would like to be remain updated with all the new exciting posts.